NEW ORLEANS – In a span of three months, Colin Kaepernick rose from an unknown backup to a starting quarterback to a postseason sensation, leading the Forty-Niners to exhilarating wins over such formidable foes as the Patriots, Packers and Falcons. In Super Bowl XVLII, the pride of Turlock drove his team to the brink of an unprecedented comeback win. Then after San Francisco’s final drive fell agonizingly short, the Forty-Niner delivered another gutsy performance. 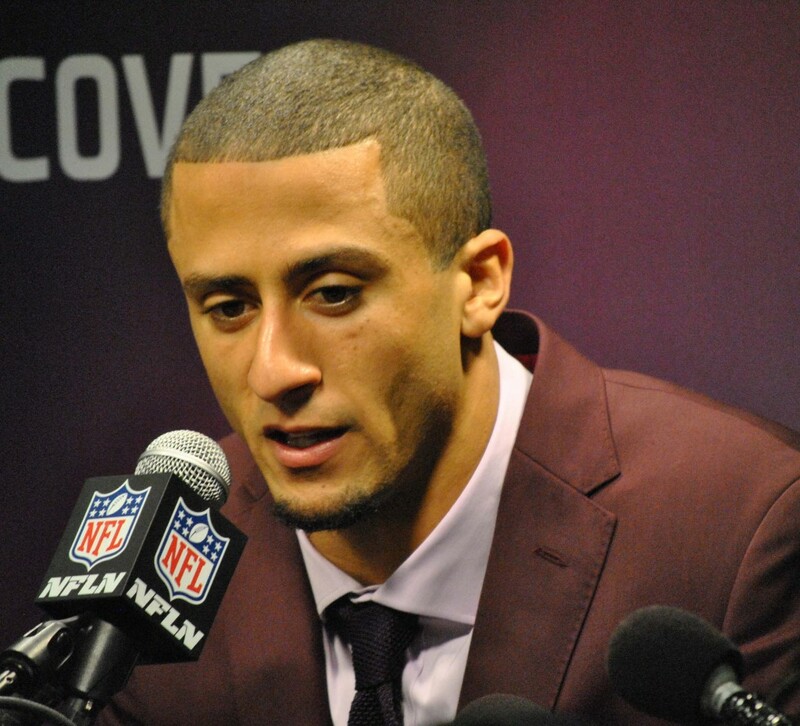 “I feel like I made too many mistakes for us to win,” a glum but stoic Kaepernick told the assembled media. 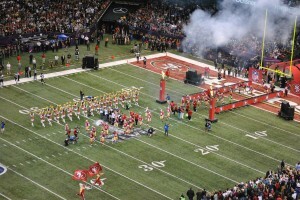 The Forty-Niners take the field prior to Super Bowl XLVII. San Francisco committed multiple mistakes in its first Super Bowl since 1995, but Kaepernick made precious few of them. Teammate LaMichael James’ fumble, defensive penalties, and a special teams lapse that allowed the Ravens to score a record-breaking 108-yard touchdown all loomed large in the 34-31 defeat. Aside from throwing an interception in the second quarter – “I just led him too far,” he said of the pass intended for Randy Moss – Kaepernick delivered a performance worthy of MVP consideration. The quarterback threw for 302 yards, delivered a touchdown pass, broke another Super Bowl record by running a 15-yard touchdown in himself and nearly completed the greatest come-from-behind victory in the big game’s history. Not bad for a 25-year-old starting just his tenth NFL game, but according to him, not good enough. Kaepernick refused to point fingers but his head coach did not. In his comments after the game, Jim Harbaugh took exception with the game’s officiating, especially in the final minutes when the Niners drove to within five yards of a go-ahead touchdown. “On that last drive when we got the ball and had time to go down and score a touchdown, we thought it was our game,” Kaepernick said. On fourth down, Kaepernick threw a pass to Michael Crabtree in the end zone that could have won the game for San Francisco. But the ball – and with it, the Lombardi Trophy – fell just beyond his reach. Baltimore cornerback Jimmy Smith grabbed Crabtree in the end zone and well beyond the five yards of contact permitted from scrimmage. The Niners screamed for a flag. None came. Instead of a San Francisco first and goal, the Ravens took over on downs, running out the clock as the game ended minutes later. Coach Jim Harbaugh disputed the game’s officiating. 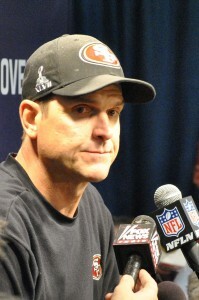 “There’s no question in my mind that there was a pass interference and then a hold on Crabtree,” Harbaugh said. Baltimore built a 28-6 lead before a bizzare power outage halted the game for more than half an hour. “Things weren’t working in the first half. We just didn’t finish our drives,” Kaepernick said. Then Kaepernick led the Niners on four straight scoring drives in the second half. He also ran for 62 yards in the contest. In the fourth quarter, San Francisco came within a two-point conversion of tying the game. “We had good plays; we had bad plays in the red zone. They’re out there trying to play defense just as hard as we’re trying to play offense. We were just trying to score any way that we could,” the quarterback said. Does Kaepernick believe that he played well? As painful as the loss was, Kaepernick’s response to blame himself displays a different kind of strength than he’s had to exert so far in his budding pro career, the kind that impresses coaches, teammates and fans.